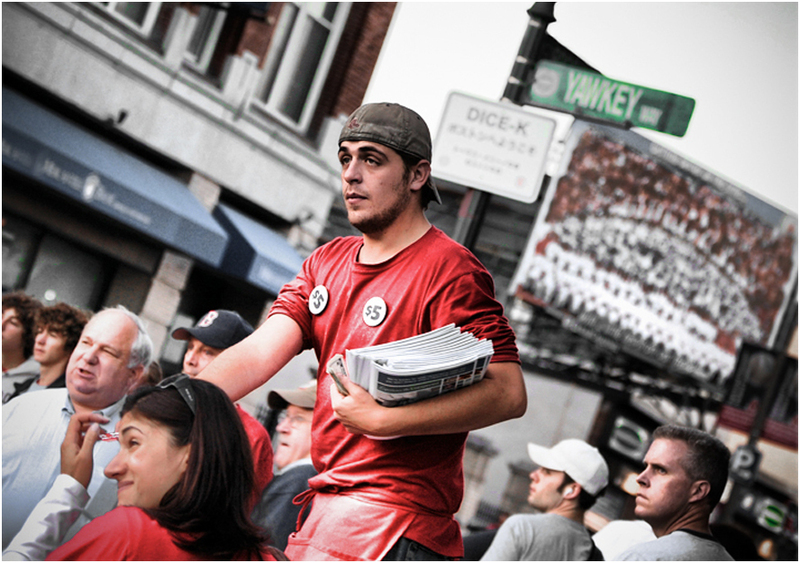 ← Happy Birthday Babe and Clint and Brady…..
Post season play returned to Fenway Park in 2007 and it involved yet another historic Red Sox comeback. 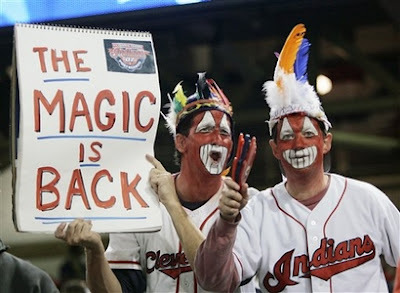 This time it was the Cleveland Indians who fell victim to the Fenway magic. Manny hits walk-off homer in Game II of the division series against the Angels. After sweeping the Angels in the Division Series, CC Sabathia and the Indians came to Fenway to open the Series that would decide the American League Champ! The Red Sox pounded Sabathia in game one on their way to a 10-3 win. The following night, the Fenway Faithful watched the Indians score seven times in the 11th inning to even the series and the action switched to Jacobs Field in Cleveland where the Indians took games three and four grabbing a commanding three games to one lead. 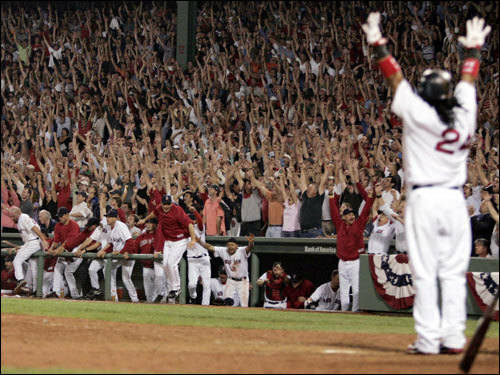 Facing elimination, the Red Sox rode an 11 strike out performance by Josh Beckett to a 7-1 win and a trip home to Fenway. In the bottom of the first inning, of game six, JD Drew stepped to the plate with two outs and the bases loaded. He ran the count to 3-1 and then…..
Blam! A Fausto Carmona fastball landed in the centerfield bleachers, the Red Sox were ahead 4-0 and hearts sank in Cleveland. The rout was on as the Red Sox added six in the third on their way to a 12-2 drubbing of the Tribe. 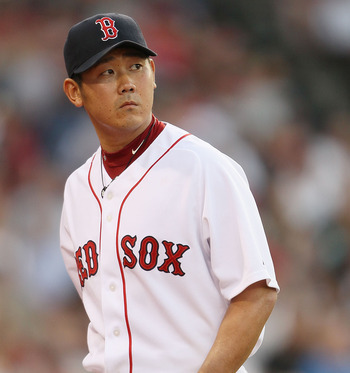 It was now down to yet another winner take all game the next night and a Red Sox rookie pitcher from Japan would get the start. Dice K was worthy of the task and with help from Hideki Okajima and Jonathan Papelbon he held the Indians to only two runs while Dustin Pedroia’s three hit five RBI night led the offense propelling the Red Sox to an 11-2 win and into their second World Series in four years; something which had not happened since Fenway Park opened her doors nearly a century before. Their unlikely opponent in the World Series was the Colorado Rockies who won a phenomenal 21 of 22 games in a September stretch in which they captured the wild card. They then swept both the Phillies and the Diamondbacks and then awaited the outcome of the Red Sox, Cleveland series. 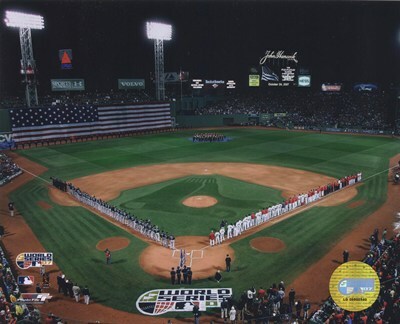 On October 24th Fenway Park was the sight of the opening of the Series. 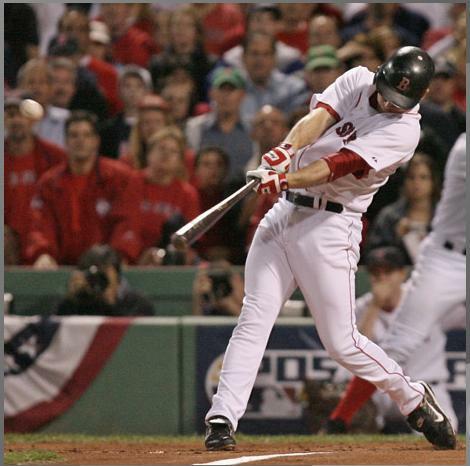 After Josh Beckett struck out the side in the top of the first inning, Dustin Pedroia led off for Boston. And he took Jeff Francis’ second pitch over the left centerfield wall and deep into the Fenway night staking Beckett and the Red Sox to a 1-0 lead. 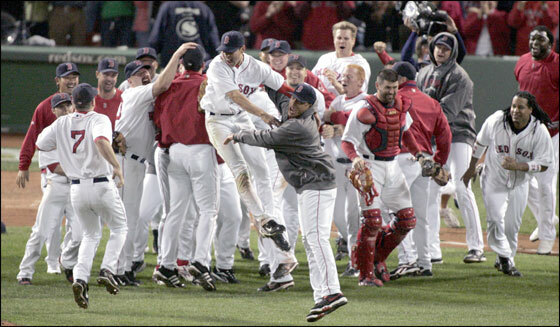 They never looked back, as every Red Sox regular but Mike Lowell had an RBI in a 13-1 romp. Game two pitted Curt Schilling against Ubaldo Jimenez and this game was everything game one was not. Schilling, in what had been the Red Sox formula all year, got some help from Okajima and Papelbon beat Colorado 2-1 and the Red Sox headed to Colorado just two games away from winning another World Series. 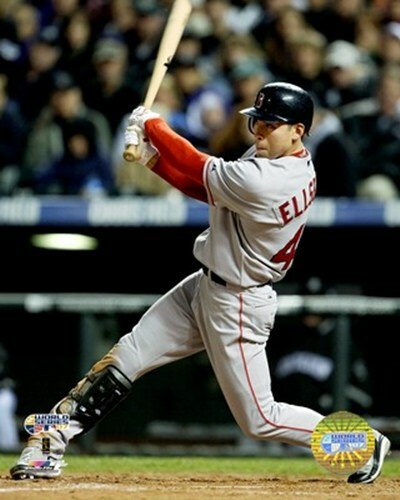 In game three Jacoby Ellsbury’s 4-5 spurred the Red Sox to a 10-5 win in a game that saw the Sox jump ahead 6-0, the Rockies get to 6-5 before the Red Sox put it out of reach. One win now was all that separated the Red Sox from being champions of the world. In, what was the best played game of the Series, the Boston Red Sox defeated the Colorado Rockies 4-3 in game four, completing their second sweep in four years and earning the title World Champs for the seventh time! 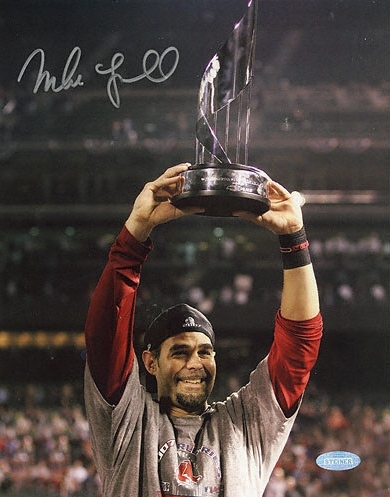 Third baseman Mike Lowell was the Series MVP. 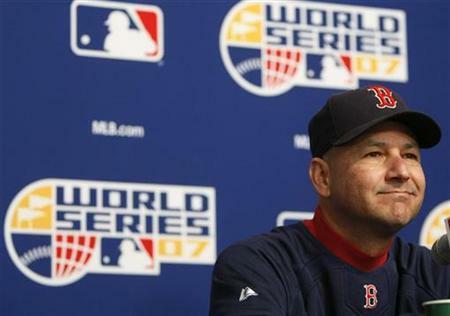 Manager Terry Francona became the first Red Sox manager to win two World Series since Bill Carrigan did it in 1915 and 1916. It also made him 8-0 in World Series games as Red Sox manager. That’s the most World Series game wins to start a managerial career in major league history, and the most wins without a loss over a manager’s career. 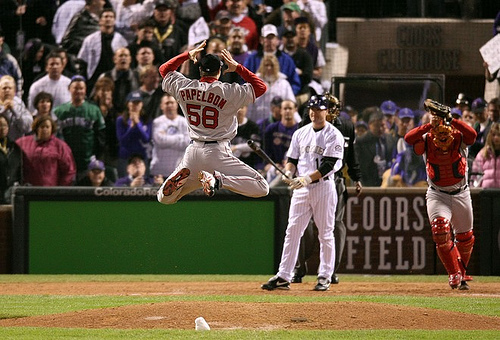 And the Fenway Faithful were pinching themselves, for the glory days of early Fenway Park had returned! 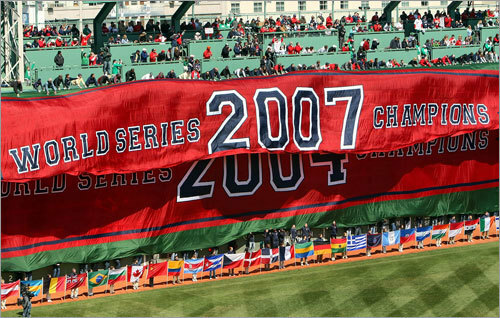 This entry was posted in Fenway Park Baseball and tagged 2007 World Series, Bill Carrigan, Curt Schilling, Dice K, Dustin Pedroia, Fenway Faithful, Fenway Park, Hideki Okajima, Jacoby Ellsbury, Jonathan Papelbon, Josh Beckett, Mike Lowell, Red Sox, Terry Francona. Bookmark the permalink. What great memories! Thanks for the reminder! A Fenway hero as well!